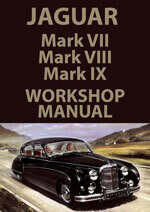 This workshop manual is the most comprehensive manual available for repairing, restoring and maintaining your Jaguar Mark 7, 8 or 9. This Jaguar Workshop Manual is for the following Jaguar Cars made between 1951-1960. Jaguar MK7, 8, and 9 Workshop Service Repair Manual $19.99 Immediate Download!